Yesterday I shared my Spring makeup picks and today I want to share with you the fragrances that I'll be wearing over the coming months! In winter I tend to favour warm scents but for Spring, I like fresh, airy fragrances to reflect the change in season. I have three beautiful perfumes to share with you today! Chloé Nomade EDP: My husband treated me to this in New York & I love it! The bottle is designed to look like the Chloé Drew bag - I love the gold and blush pink accents and it feels weighty and expensive. The fragrance itself is lightly floral and sweet with notes of freesia and cherry plum but it dries down to a musky, powdery scent - it's quite unique and very feminine. Have a spray at a counter and you'll see how the scent changes over time. 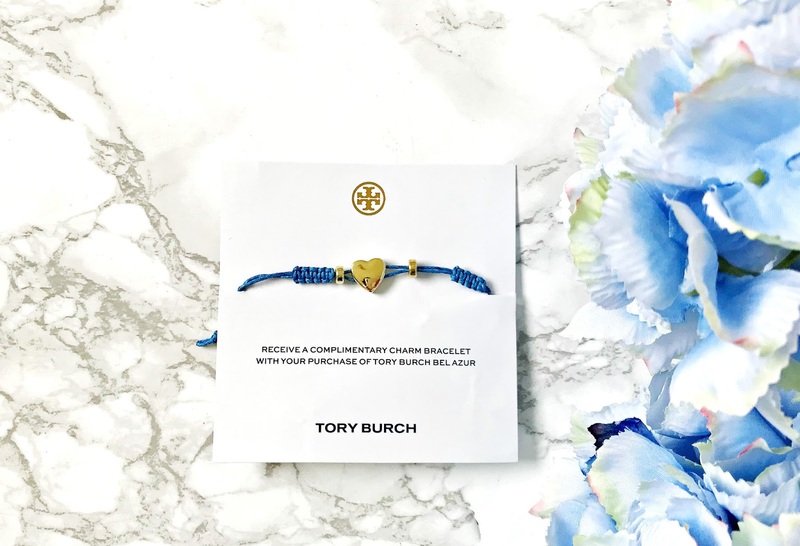 Tory Burch Bel Azur: Everything about this perfume, from the stunning ombre blue bottle to the fragrance itself, screams summer and sunny beach days! The notes of mandarin, tuberose, bergamot, vertiver and neroli, combine to create a fresh, airy fragrance with a hint of citrus. It's perfect for both day and night wear and although the bottle is quite heavy, I will definitely be packing this for my sun holiday in June! 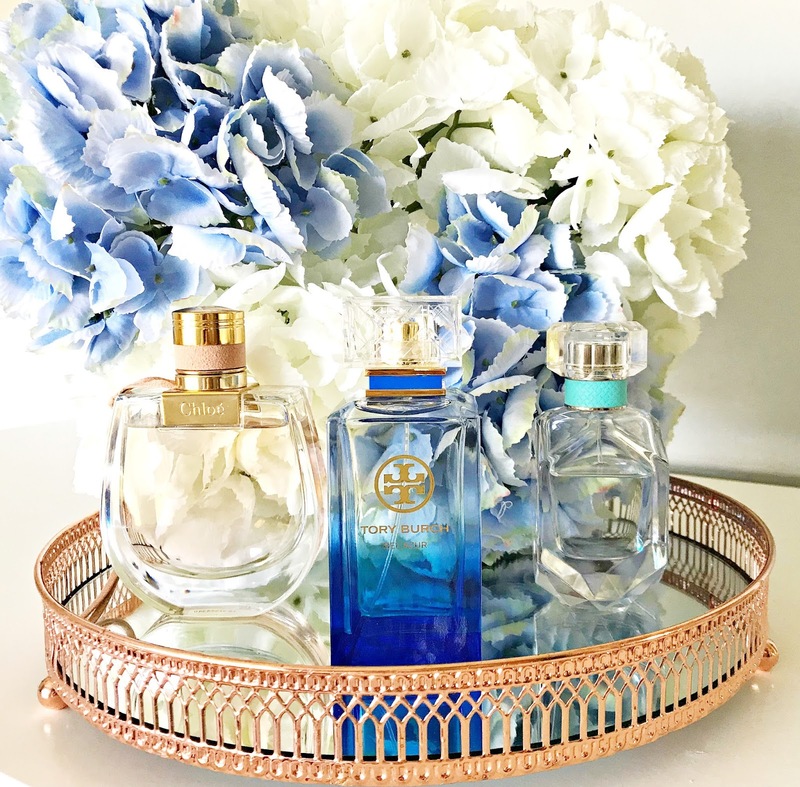 This perfume is exclusive to House of Fraser and they also have an offer whereby you will receive a free Tory Burch charm bracelet when you purchase this perfume, and it has the same stunning blue colour as the bottle, reminiscent of the sea! Tiffany & Co. EDP: This was a Christmas gift but I think it's a perfect Spring scent! It's a very sophisticated, feminine scent with notes of iris, patchouli and vert de mandarin. I would describe it as a sparkling, floral and musky scent and it's very different to everything else in my collection. I also love the stunning diamond shaped bottle - who doesn't want some Tiffany in their life? Do you change your fragrance with the season or do you have one signature scent that you wear all year round? I really love the idea of that but don't think I could commit to just one perfume! All of these fragrances are available from House Of Fraser and you can find some more Spring fragrance inspiration here! All products are bought by me, unless otherwise stated. The Tony Burch perfume was kindly sent to me. Opinion is always my own. Spring nail picks from CND! The products worth placing a Sephora order for! New releases from Too Faced! Cut Crease made easy with HAX!